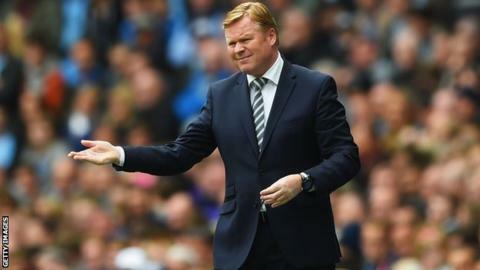 Southampton boss Ronald Koeman "knows all the tricks" for Europa League success, says former player Jimmy Case. Koeman, 52, won the European Cup with PSV Eindhoven in 1988 and Barcelona in 1992 and has managed in the Netherlands, Portugal and Spain. Arsenal's FA Cup win on Saturday confirmed Saints' place in Europe and Case backs Koeman to impress. "With European competition Koeman's been there, he knows all the tricks and he's managed abroad," Case said. "I'm sure that tactically he's more than capable of getting a team to perform in Europe, but it's all about the squad." The Saints lost 2-1 on aggregate to Romanian side Steaua Bucharest in the first round of the Uefa Cup in 2003-04, their last European experience. Case made more than 200 appearances for Southampton over a six year period and won the European Cup three times with Liverpool, as well as the Uefa Cup and Super Cup. Does the Europa League damage a season? Former Everton captain Phil Neville: "The first couple, you're fine but it's the third, fourth, fifth game in the group stage that hits you hard." "Koeman has got his sidekick Sammy Lee, who's been in the competition as well, so it's well set up," added Case to BBC Radio Solent. "If you've not generally played in Europe consistently it's a new venture. I think for Southampton it could be healthy." Southampton, who came seventh in the Premier League, qualify as Arsenal had already secured their Champions League place by finishing third in the league. Koeman's side will enter the Europa League at the third qualifying round stage, needing to win two two-legged matches to qualify for the group stages of the competition. Southampton's first competitive game of the 2015-16 season will now be on 30 July, before the second leg on 6 August. The Premier League season begins on 8 August.